For many years I sketched, and tried to work out in my imagination, how the scene of the LOAVES AND FISHES, with its multitude of people, could be painted. I wanted this image to honor native peoples in many parts of the world; those who work the land for their livelihood, and have lived for generations in small communities or villages. In 1986, I completed an 18” by 24” acrylic painting on canvas with bright colors, rolling hills and high floating clouds. 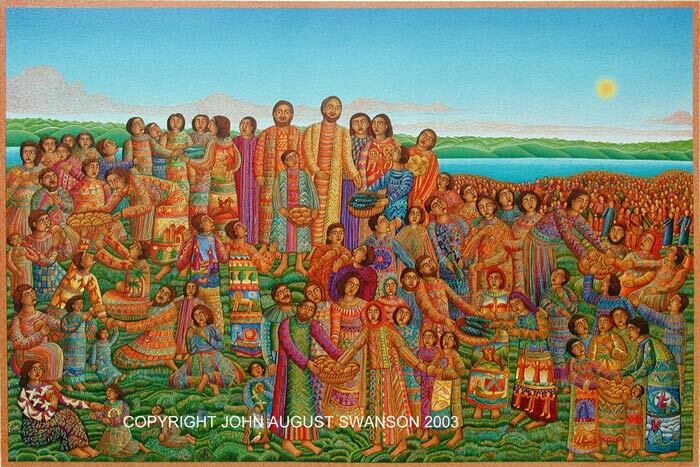 The people in my painting are wearing garments with many colors and patterns, inspired by the creations of the makers of cloth, the weavers, and the dyers of Central America, Mexico, and parts of Africa and India. The Bergsma Gallery, of Grand Rapids, Michigan sold the painting to Trinity College, Palos Heights, Illinois. The image from this painting proved popular with various groups, and it has been used on books, hymnals, posters and bulletins, by the Presbyterian Church USA, Oregon Catholic Press, Novalis Publishing, and Orbis Books. In early 2003, I began to consider revisiting and recreating this image as a serigraph in collaboration with Master Printers, Jim and Sandy Butterfield of Aurora Serigraphics. I had further developed my own abilities to work with colors, and complex detailed images; and I had a more expansive perspective. I chose to make the image larger, 24” by 36”. The meticulous process of creating a drawing for each of the 54 stencils gave me the chance to build up the colors, patterns and textures, and develop the work much further than I could with the painting. Drawing with fine technical pens, I built up stippling and shaping with each stencil. After each stencil was printed, in responding to the changing image; I felt the work itself guided me to the next color. New screens were made for each color to achieve the proper fabric tension required for very precise color registration. I custom mixed the inks for each printing using a clear varnish and oil paints. The inks are alternately layered opaque and transparent. This layering creates an effect of intricate built up textures, and rich saturated colors. 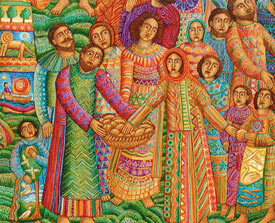 My image of LOAVES AND FISHES emphasizes and reminds us of the basic needs of all humanity. We all share the need for food and for providing for our families and communities. If we take the cosmic view, that there currently exists enough of what we need to sustain the world; we urgently need to consider sharing the resources that have been entrusted to us. Dimensions: Image: 24" x 36"